The more I travel around the world, the less surprised I am when I find a local connection. In Northern Ireland we found a connection to my home state of Texas at Glenveagh National Park and Castle located in the heart of the Derryveagh Mountains. During a tour of the Visitor Center, we learned that John George Adair was born in Ireland but made his fortune at his ranch in the Palo Duro area in the panhandle of Texas. As we enjoyed lunch in the outdoor courtyard listening to two accordion players serenade visitors with local tunes, I marveled at how small our world seems at times. We sampled a variety of foods, including delicious desserts, sandwiches, quiches, soups, salads, and rolls, still made in the original castle kitchen. Best of all, the sunshine made for a glorious afternoon, perfect for strolling thru the lush landscaping. Set in the remote wilderness of rugged mountains and pristine lakes in northwest County Donegal, Glenveagh Castle and Gardens have a timeless beauty. It's easy to understand how Adair fell in love with the property when he first saw it in 1857. After adair married in 1867 he built Glenveagh Castle, inspired by Balmoral Castle, Queen Victoria’s Scottish summer home, on a promontory out over the lake. When he came, there were no trees, just 40,000 acres of open land. Now the estate is full of pine trees and gardens. Colorful blooms and green foliage soften the stark lines and gray roughness of the stone from which the castle was constructed. The local stone was hard to carve, so that the exterior finish is somewhat rough. After Adair died in 1885, his widow improved the grounds, gave parties, and provided employment for local residents. She enjoyed entertaining local people and sponsored deer hunts on the grounds. The deer theme is central to house décor and can be found on china and in many paintings. A “leaping deer” design is featured on one of the 21 different sets of china. Belgian refugees were housed in 11 bedrooms at the castle after WWI. 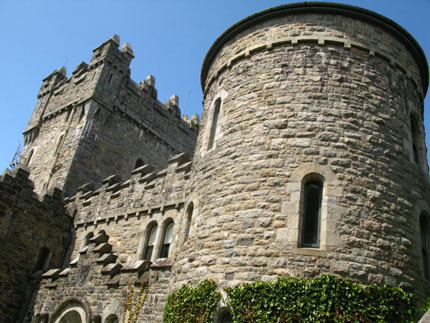 Arthur Kingsley Porter bought the castle in the 1920s, and American university professor HenryMcIlhenny bought the property in 1937. Fascinated by Irish architecture, he owned Glenveagh till 1983 during which time he restored the castle and grew Tuscan-style gardens. Two large eagles guard the entrance to the castle area. Shell designs on walls; deer heads; many wildlife paintings, some depicting death; furniture and accessories remain just as when McIlhenny lived there. 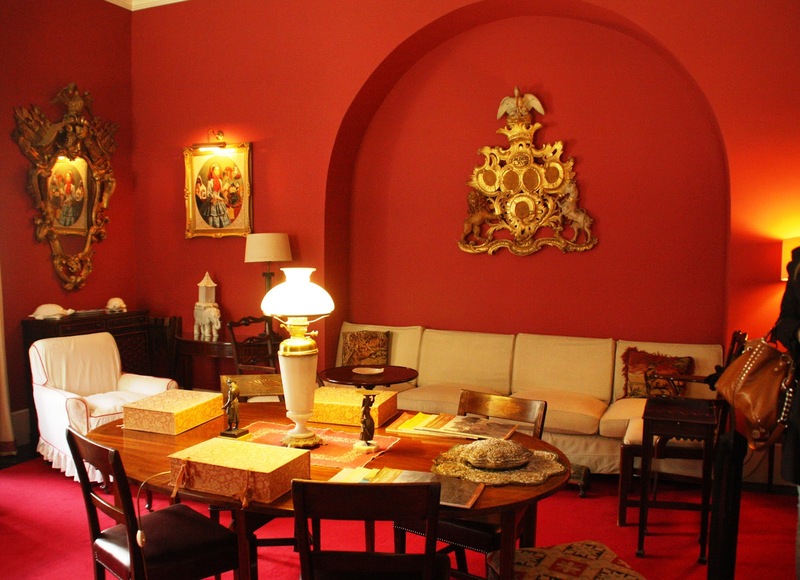 Bold red wallpaper and cloth wall coverings hide imperfections in the walls. 72 vases are all filled with fresh flowers daily from surrounding gardens. In 1975 McIlhenny sold the property to the state as a national park, and it opened in 1994 to the public. 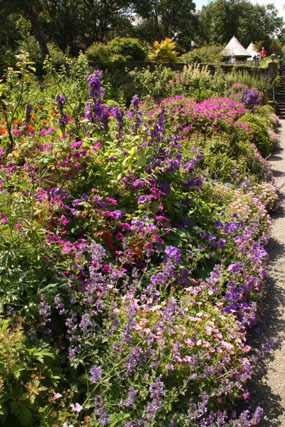 During his ownership the estate good records of all the plants grown there were maintained much like a botanic garden. Heritage plants are preserved in the extensive formal gardens, and many paths wander through woodland areas with open spaces overlooking a beautiful lake. Purple, pink, white, and yellow blossoms from ankle level to tree tops provide natural embellishment--and reminiscences of wonderful southern gardens in the U.S.